Hotmail will be switching on Exchange Active Sync connections for mobile phones on Monday 30 August. (The feature has been in development for some time and a number of users who figured out the server name have had intermittent unofficial access during tests, but this will be the official launch. EAS has several advantages over a POP or IMAP connection; push email from multiple folders arrives on the phone when it arrives at your Hotmail account and email that you read on your phone will be marked at read on Hotmail (and vice versa). EAS can also sync Windows Live Contacts, Windows Live Calendar and (on some devices) tasks as well as email. 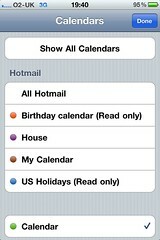 Hotmail EAS can support multiple calendars, although not all devices will get more than the main calendar. 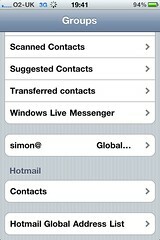 On the devices we tested only Windows Live contacts synced, not contacts from a Facebook account we'd linked to Windows Live. This is a major development for Windows Mobile users; it's the first time you've been able to sync calendar and contacts onto a device without needing Exchange or a separate sync app. For other devices it means Hotmail catches up to other email services — like Gmail — which have been using EAS to sync to mobile devices for some time. The majority of smartphones work with EAS (BlackBerry doesn't unless you use a third-party mail client like AstraSync or NotifySync); Microsoft tells us that EAS "works best on Windows Mobile, iPhone, Nokia or Palm smartphones" (and only Windows Mobile 6.x and above, not Windows Mobile 5). Microsoft also noted that "Android is currently not fully compatible with Exchange". That doesn't mean that your Android device won't work, but what EAS features are supported does depend on the handset manufacturer and the version of Android. Some devices (like older iPhones, Windows Mobile 6.5 devices and the HTC Desire for example) only support a single EAS connection, so you can't connect the same phone to both Hotmail and Exchange by EAS; others (the Palm Pre, iPhone 4, Windows Phone 7, the Nexus One for example) support two or more EAS connections. The Motorola Milestone running Android 2.1 let us connect two email accounts by EAS (Exchange and Hotmail) but only one calendar and set of contacts by EAS. Many smartphones look for a Hotmail email address and autoconfigure the account for POP, so you need to do a manual email setup on Windows Mobile (via ActiveSync rather than the mail app) and Palm and choose an Exchange account on other devices. Use the m.hotmail.com URL as the server name, your full email address as the username and leave the domain blank (and if you try it before the service is officially launched you'll be asked for your password repeatedly and the sync won't work). 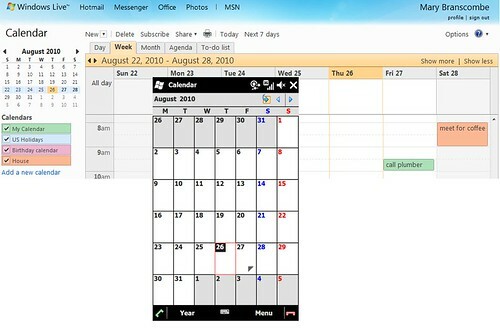 Windows Mobile 6.x can sync email, contacts, calendar and tasks from Hotmail (using the new To-do list in Windows Live Calendar for tasks); it also offers to sync text messages, which is something Exchange supports and Hotmail doesn't. Windows Mobile can only sync one calendar, so you only get the main calendar; the same is true with the Android devices we tested and the Palm Pre. 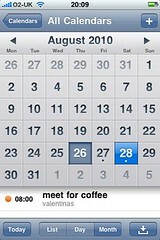 iPhone syncs email, contacts and calendar — and it was the only device we tested where if you have multiple calendars online they all sync, so you get your own calendars, calendars shared with you at your Hotmail address, calendars you've subscribed to and calendars from Windows Live Groups. Android devices sync email, contacts and calendar items — but as noted, not all devices allow you to sync all of these from multiple accounts and none of the Android phones we tried could sync tasks. Palm syncs email, contacts, calendar and tasks from multiple EAS accounts; it gives you a task folder per account, colour-codes calendars from different accounts in an overlaid view and shows all contacts together (but it only gets the primary calendar). Windows Mobile often defaults to checking email at intervals during 'off peak' hours, so remember to change this for push email. With that changed, email arrived on all the test handsets at the same time as it did in Hotmail (although some of the Android devices had a slight delay on some messages arriving) and the read and unread status was correct on all devices. You get new mails as they arrive, and older messages depending on how many days of email you chose to sync. Of all the devices we tested, again only the iPhone rendered HTML email correctly; on Windows Mobile, Palm and Android showed the text from messages but not images, which appeared as links or attachments. Microsoft says there is a limitation in the Windows Mobile 6.x ActiveSync client that doesn't support HTML email with the version of EAS used by Hotmail even though Windows Mobile 6.5 supports HTML email with the right version of Exchange. 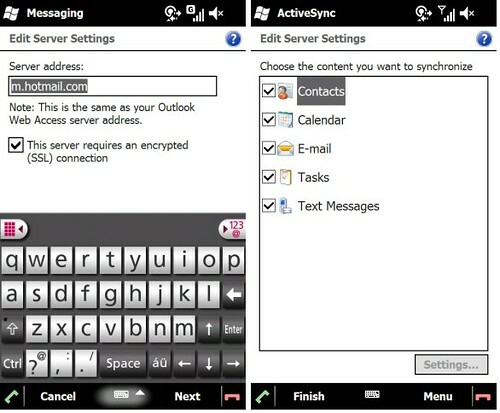 In short, no device supports the full set of Hotmail EAS sync options; only iPhone has HTML email and full calendars but it lacks tasks, Palm and Windows Mobile sync tasks but not multiple calendars or HTML mail. 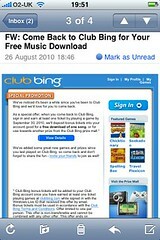 This isn't Hotmail's fault; they're sticking to the documented standard. Adding EAS is playing catchup for Hotmail, but it seems that Microsoft has taken the time to make it work properly; leaving aside the variable capabilities of devices, sync is fast and simple and supports almost all the information you have on Windows Live and Hotmail, with none of the glitches and frustrations of Google Sync.